My previous blog post I ended with the main activity of microbes in marine sediments: the breakdown of organic matter deposited from the water column. The sedimentation rate at which organic matter is deposited at the sea bed is dependent on the particle size and on the water velocity above the sea bed. In the previous blog you could read that pockmarks affect the water movements above the seabed, which affects the sedimentation and re-suspension rates of particles. A difference between normal sediments and pockmark sediments in the sedimentation rate of organic matter could have an affect on microbial communities in these sediments. In our publication on bacterial communities of the Olsofjord pockmarks we found that they are different from the surrounding seabed. But before I explain more about this result, I would like to explain how we did our experiment. We set up our experiment with the plan to collect three sediment cores from three pockmarks and three reference sites in the Oslofjord. 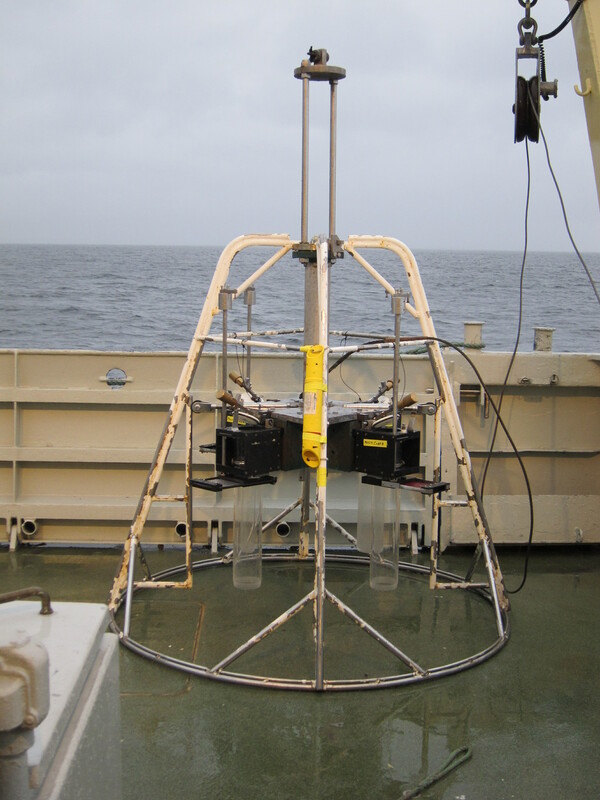 To sample the sediments about 70 m below the water surface we used a coring device (see figure above). The crew of the research vessel was not very enthusiastic about this machine because of their early experiences. Luckily for us, everything went super smooth and at 5 sampling locations we got four perfect cores on board. After the fifth site, the captain decided it was enough – it was Friday afternoon – so we got samples from three pockmarks and only two reference sites for our experiment. First I was disappointed here, but now I think it did not matter so much. The results were consistent between the two reference sites. A third site would not have changed our results. A split sediment core. The core is oriented with the top of the sediment at the top of the photo. Clearly visible is the change in sediment structure with sediment depth. 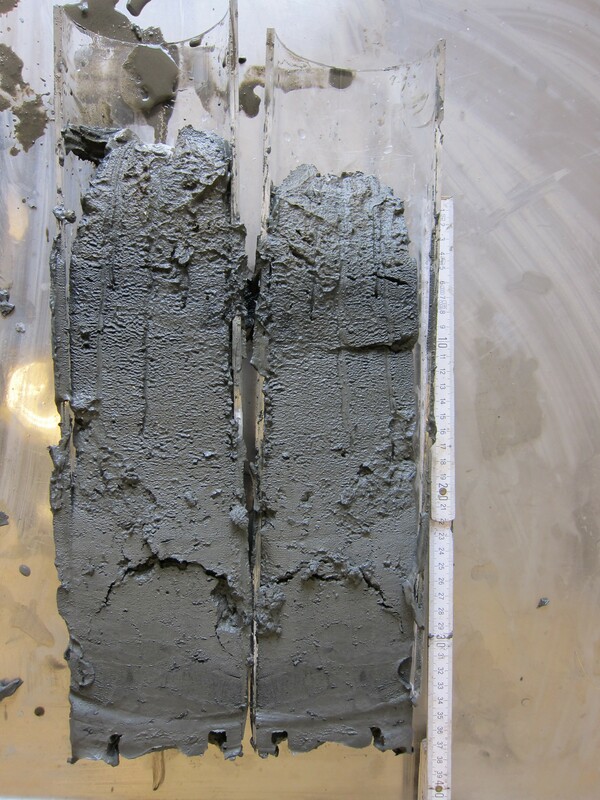 The sediment samples were split in the lab (see figure above). We sampled the cores at two positions: 0-4 cm and 40 cm depth. At these sediment depths we took material to analyse the porewater chemistry, polycyclic aromatic hydrocarbons (PAHs) and material for DNA extraction. The DNA was used to amplify the 16S ribosomal RNA (16S rRNA) gene with the polymerase chain reaction (PCR). The 16S rRNA gene is widely used to determine which bacterial species are present in the environment and we use it here to compare the communities we sampled. Each cell has the 16S rRNA gene and with PCR we can multiply these genes and generate lots of small fragments. The species composition for each sample is determined by DNA sequencing of these fragments and the comparison of our data with a taxonomical database containing reference sequences. The porewater chemistry of our sediments indicated a strong difference between the surface and 40 cm deep sediments (Table 2 in my paper). This differences was due to different concentrations of total carbon, total organic carbon and nitrogen between these two depths. When we included in our analysis if the sediments were from a pockmark or from a reference sample we found a significant difference for the carbon concentration at 40 cm depth, but not for nitrogen. The 40 cm pockmark sediments had lower porewater concentrations of carbon than the reference sediments. In contrast, we did not find a significant difference in porewater concentrations between the 0-4 cm pockmark and reference sediments. With this information we concluded that the reference and pockmark sediments showed different carbon concentrations deeper in the sediments, but not at the surface. At this point we take a look at the bacterial diversity of our sediment samples. The analysis of 16S rRNA fragments is done by grouping the sequences in operational taxonomic units (OTU). We talk about OTUs instead of species, because we grouped closely related sequences to distinguish different “species” although they might not resemble true species. The species concept for bacteria is a difficult topic that could easily fill multiple blogs (an interesting start could be the section of the definition of species in wikipedia), and that is why I will not discuss it here. A) Rank abundance curves for all samples at the 97% sequence similarity cut-off. Black depicts the rank abundance curve for all OTUs in all samples. Red indicates the rank abundance curve for the 28 OTUs shared across all samples. 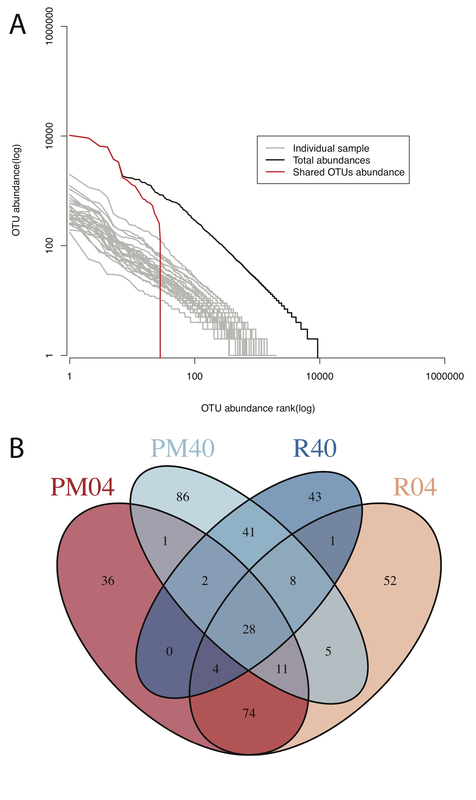 In grey the rank abundance curves are plotted for the individual samples B) Venn diagram showing the number of OTUs shared between each of the four groups: Pockmark 0–4 cm (PM04), Pockmark 40 cm (PM40), Reference site 0–4 cm (R04) and Reference site 40 cm (R40). In the figure above you see that we found close to 10.000 OTUs in all the samples combined (Figure 3A). Despite this high diversity between the samples we only find 28 OTUs in all samples, but they dominated in DNA sequence abundance (Figure 3). Within a group we find more OTUs, but this never is higher than 182 (Samples PM40). This shows us that the Oslofjord sediments contain many bacterial species. In addition, we see that even within a treatment there is lots of variation in species composition. These results are typical for marine sediments. Despite the high diversity we can still use this species composition information to test if the communities from the pockmark and references samples are different. In our paper I used multiple tests, but here I will only discuss the most interesting one. This result was obtained using a technique from multivariate statistics called constrained correspondence analysis (CCA). With this method we can study which chemical parameters are responsible for the community differences we found in our experiment. Two-dimensional CCA ordination of the samples using one constrained axis (CCA 1) and an unconstrained axis (CA 1). The constraining factor was Total Carbon. Eigenvalue for both axes are indicated beside each axis. Environmental parameters that significantly (p<0.01) correlated with the ordination were fitted using the envfit command (Vegan package). Abbreviations: total nitrogen (TN), total carbon (TC), total organic carbon (TOC). The four groups are: Pockmark 0–4 cm (PM04), Pockmark 40 cm (PM40), Reference site 0–4 cm (R04) and Reference site 40 cm (R40). 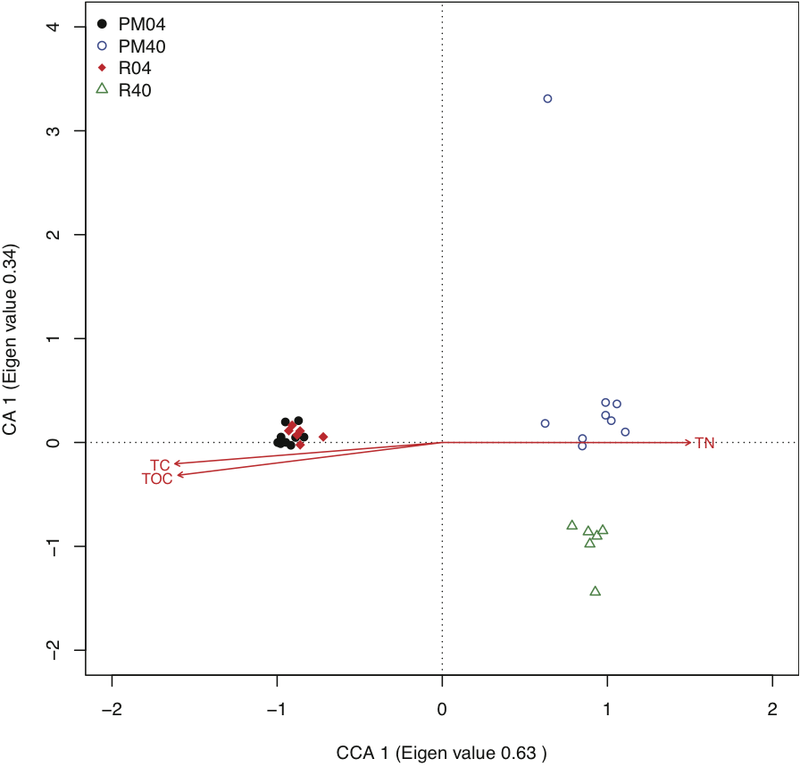 The CCA analysis shows us that the main chemical gradients of carbon and nitrogen are responsible for the differences between the communities. The biggest difference is between the 0-4 cm and 40 cm communities. Furthermore, we find that the 0-4 cm communities are all very equal as seen by the tight grouping of these samples. But the most interesting thing is that the 40 cm communities are not only more distant from each other, but there is a clear separation between the pockmark and the reference samples. This means that these communities have a different community composition. To better understand these differences we classify our 16S rRNA fragments and test which taxa have a different abundances between pockmarks and reference sediments. To do this we used an method called metastats, which compares the species composition between two groups of samples. 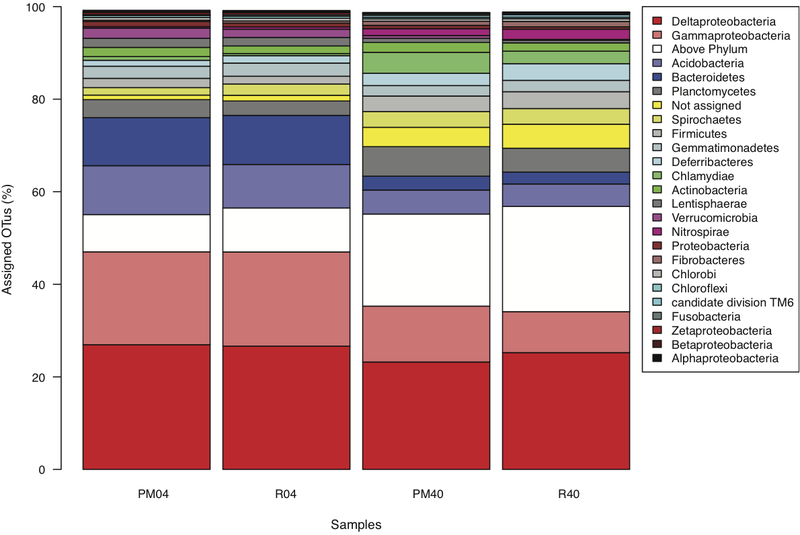 This analysis (Table 4 of our manuscript) indicated that many bacterial groups from different phyla had significantly different abundances between 40 cm pockmark and reference sediments. Here I only wanted to show the differences in phylum level classifications. Although this is a very rough view, it is already possible to see that the OTU abundances for the Delta- and Gammaproteobacteria groups are different as well as for many OTUs that could not be easily classified (above phylum, not assigned). One group that is stricking is the group of Nitrospirae, which had a much higher abundance in the 40 cm reference samples than in the pockmark samples of the same depth. The above results demonstrate that there is a small but detectable difference between bacterial communities from normal and pockmark sediments, but only at 40 cm depth. A difference was not found at the sediment surface and this is due to the influence of the water column on the microbial communities in the sediment surface. Although, we failed to point out which factor is responsible for our observation we have indications that the organic matter breakdown in the pockmarks is different from the normal sediments. We already know that the sedimentation rates and re-suspension rates are different inside pockmarks, but we don’t know how this affects the microbial communities over longer timescales. For instance, is organic matter transported away and we have therefore lower carbon measurements in the pockmark sediments at depth, or is the larger particle size inside pockmark sediments allowing for a faster breakdown of organic matter in these sediments. The large particle size causes also a large pore size between the sediment particles. At this point it is not clear how that effects the community composition within marine sediments and how that affects the metabolic capacity of the present bacteria. These questions are still open, and I hope that I or somebody else can repeat this experiment in the future and address those questions. This entry was posted in Publications and tagged bacteria, community, fjord, marine, microbes, microbial community, microbial ecology, microbiology, organic matter, Oslofjord, pockmark, publication, re-suspension, sediment, sedimentation. Bookmark the permalink.